My article last week was the first installment of a two-part series on how a senior can safely navigate the highly dysfunctional reverse mortgage market. I suggested that step one is to choose the combination of reverse mortgage features that best meets your needs, which can be done effectively using my HECM calculator, with or without the pro bono help of an expert. (See Selecting the Best Type of HECM Reverse Mortgage). Step two, discussed below, is to find the lender offering the best deal on the particular HECM you have selected. Reverse Mortgages Have Two Lender Price Components: This is the interest rate and the origination fee. The tradeoff between them depends on how long you will have the mortgage -- the longer you have it, the more important is the rate relative to the origination fee. My calculator does the work for you by showing how much you will owe, with different combinations of rate and origination fee, at the end of any period you specify. The Stakes Are High: In many markets, including the market for standard home mortgages, the difference between the most competitive price and the "next-best" price is modest, but in the HECM reverse mortgage market it can be huge. I have seen rate differences of over 1% and origination fee differences exceeding $14,000. Among the reasons is that seniors tend to focus on the amounts they can draw rather than what it will cost, and lenders cater to that. With very few exceptions, lender web sites do not disclose prices, and (until now) there have been no published data on reverse mortgage prices anywhere. As explained below, that will change with the publication of this article. HUD also plays a role in generating large price disparities by setting maximum origination fees. This allows lenders to charge the maximum fee in cases where they should be paying rebates, by telling the borrower that "the Government sets the origination fee." A Little Knowledge Helps: The market value of a reverse mortgage to the lender originating it depends, among other things, on the initial loan amount. This consists of upfront cash draws including repayment of any existing mortgage balance, plus financed settlement costs. If there are two transactions that are identical in all respects except that in one case the borrower is drawing the maximum amount possible in cash while in the other the borrower retains her entire borrowing power as an unused credit line, the lender will sell the first at a significantly higher price. In such case, the borrower who draws more cash should get a lower price, and will in the small competitive segment of the market. In the mainstream market, however, the mortgage with greater market value is more likely to generate a larger markup for the lender. Where Do You Find Competitive Prices of Your Transaction? The best rule for finding lenders who don't overcharge is to seek them on multi-lender shopping sites, where their prices can be compared to those of others. Lenders participating in such sites are prepared to price competitively. That has long been the case with standard mortgages, and it is true as well for reverse mortgages. The difference is that there are about 8 or 9 multi-lender sites covering standard mortgages, whereas at present there is only one that covers reverse mortgages: mine. At this writing, 9 lenders participate. Remember, A Price Quote Is Just a Quote Until It Is Locked: A price quote is not binding on the lender until it is locked, which does not happen until the house has been appraised, the application has been processed, and the prospective borrower has been counseled. The lock price should be the price the lender is quoting to new shoppers on the lock day, which on a multi-lender shopping site the borrower can check. In the mainstream market, lots of luck. 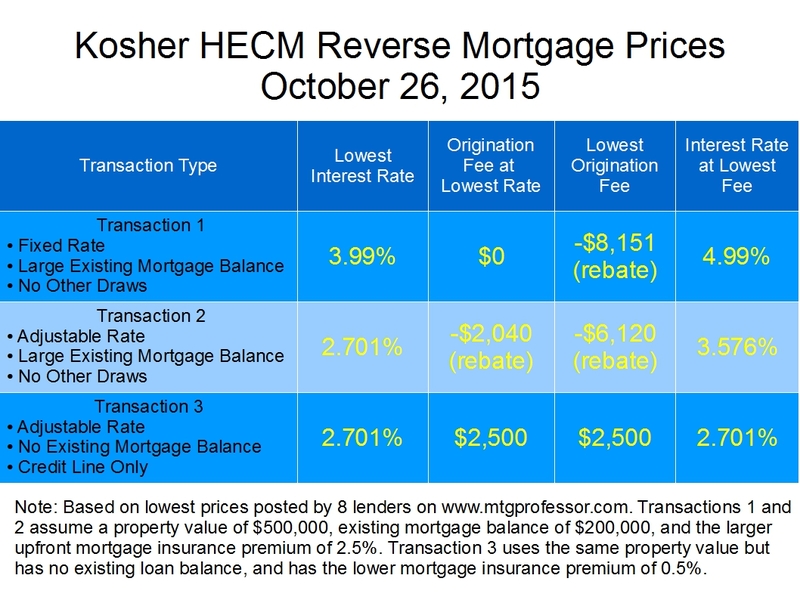 To view live Kosher HECM Reverse Mortgage pricing, access my Reverse Mortgage Calculator, or for more information on mortgages in general, visit my website The Mortgage Professor.